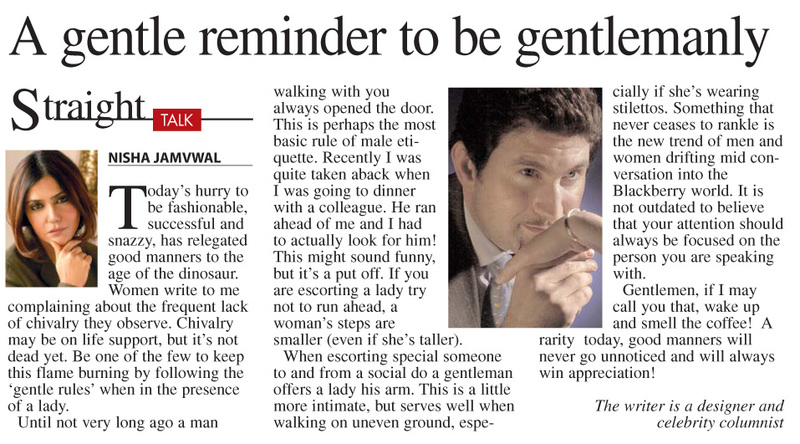 Gentle reminder to be Gentlemenlike ! I walked up at a recent dinner to the table of the ex traffic commissioner's to say hello, and after the initial hello , fully expectant that he'd stand, waited to start the conversation! So you can imagine my shock when he continued to sit most indolently, while I on my part chatted, inadvertently waiting for him to stand! Perhaps he must've felt that being the ex commissioner absolved him of good manners? Today’s hurry to be fashionable, successful, smart and snazzy, have relegated etiquette and good manners to the age of the dinosaur. So many people grow up learning how to be financially astute, street smart, ambitious, wear ‘the best’ and appear equipped with all it takes to ‘make it’ and I see the beginning of the end of even the basics of good manners! Women write to me complaining about the frequent lack of chivalry they observe. What is left unattended in a fast zone internet world, with everyone in a hurry to make it and break it (records that is) is this complete lack of attention to the subtle nuances of chivalry. Chivalry may be on life support, but it is not dead yet. 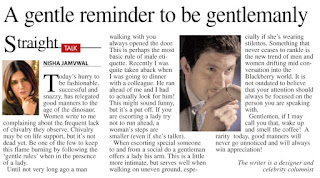 Be one of the few to keep this flame burning - by following 'gentle' 'rules' when in the presence of a lady. Until not very long ago a man walking with you always opened the door. This is perhaps the most basic rule of male etiquette , easiest to follow. So you can imagine my horror when a business associate walked into the door and me , fully expectant of him opening the door walked in behind him, only to find it hit me on my nose , quite hard! Wow, is this the level of politeness in a man today? Whether she is about to enter a car, restaurant, club, or any place with a door, a man should always hold it open. If there are many doors, then hold them open one after the other. It may not be a norm but is a gracious gesture, when a man puts on a ladies coat or overgarment- a simple but charming and powerful action. Recently I was quite taken aback when going to dinner with a colleague-he ran ahead of me and I had to actually look for him. Where had he gone? Had I lost him? To run miles ahead while she's frantically trying to keep pace might sound funny, but is not. It’s a put off. Are we at a stage where we have to actually point out something so basic? If you are escorting a lady 'try' not to run ahead, a woman’s steps are tiny-ier (even if she's taller). Reality is quite the opposite. When escorting a special someone to and from social do’s a gentleman offers a lady his arm. This is a little more intimate, but serves well when walking on uneven ground, especially if she's wearing stilettos. And of course if she is sitting next to you, it is important that you help her be seated by pulling her chair out for her and gently pushing it back into place, with the lady seated of course. If a lady arrives at the table after you- and this is not only for your girl- if there are no available seats, you should stand up and offer yours to her. Old world charm dictated that a man always stand when a lady enters or exits the room. I really don't know if our men today are able to ‘rise’ to this but it is attractive to see. Something that never ceases to rankle is the new trend of men and women drift mid conversation drift into the blackberry world. You have lost your audience to an inanimate blackberry messenger or e mail. It is NOT outdated to believing that looking around, or at your mobile, or the lady at the table next to you is wrong and that your attention should always be focused on the person you are speaking with. It is definitely not redundant to look at a person when in conversation? This is one that most guys do remember, especially in India, but helps complete the gentleman nevertheless. When at social events, to ask a lady if you can get her something to drink (or eat) shows that you are attentive to the comfort and needs of others around you. Gentlemen, if I may call you that, wake up and smell the coffee! 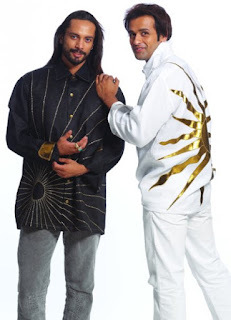 Decorum for everyday life is not the ‘Godrej Almirah’ and is relevant to our times. To elevate oneself above the rabble and noise is to display the mannerisms of a true gentleman. A rarity today- good manners and savoir-faire will never go unnoticed and will always win appreciation!! Of course, women must be genteel and possess finesse-watch this space! This is the one thing you can't blame it on the influence of the West. Gentlemenlike is expected everywhere. Well said Nish......i would love you to write a bit more about the Importance & Ignorance of the basic manners 'tehzeeb' in India. Yes indeed 'thezeeb' is age old and to be courteous & chivalrous can never be outdated! this is a guide to basic etiquette, and if it doesnt suit you please ignore it. However, God did not create man and woman to be equal, a man does not give birth and a woman does not have the same strength as a man. So they can and must not be equal. So true it was really surprising for me to read that most men have forgotten their basic etiquette. Thats sad. I wud wish to say that this article was not good but was hilarious too to a certain extent. I was just visualizing what Nisha had written. 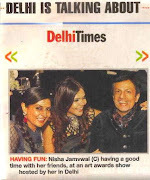 Kudos Nisha Me too a big fan of ur articles. Everybody is so involved with their blackberrys and problems that they simply choose to ignore everything around them. How to tackle those offended women Nisha?